I saw Arianna Huffington give a talk in San Francisco last weekend. She spoke about the day she found herself lying on her office floor in a pool of her own blood (she had collapsed from overwork and hit her face on her desk). She described this incident as more than a wake-up call; it was an “entry point into the journey”. Maybe you know the journey she’s talking about. I’ve had some entry points of my own, most notably the death of my infant son and the car accident mentioned in my TEDx talk. An entry point changes everything. A hero’s journey compels you out into the world. A heroine’s journey (which men can take as well as women) sends you inward and down to face a difficult truth of your soul. You’ve been wounded, disrupted, pushed to the edge: your old life isn’t working anymore. So you’re forced to go deep – because where else can you go? — and integrate some as-yet-unclaimed element of yourself, that allows you to rise again and live in a new way, in a new psychological skin. There’s a word for this: resilience. One way to foster resilience is to vow to yourself that you will use everything that ever happens to you to learn from and grow. This is possible through the twin powers of creativity and compassion. The creative act is the act of making meaning. It is not the event that determines the quality of our life, but how we choose to interpret the event; meaning isn’t something we find but what we create from the raw material of our lives. By creating meaning from our woundedness and sharing that meaning in a way that helps others – that provides insight and guidance – we also find a way to integrate and move forward. Arianna’s personal journey resulted in a book called THRIVE (it drops in late March). It is about our culture’s desperate need to redefine success in a way that reaches beyond wealth and power to include a “third metric” of wellbeing, wisdom, wonder and giving. These are the things, say Arianna – and ancient philosophers support her in this – that restore us to ourselves and connect us to our loved ones, our communities, the very pulse of life itself. It seems to me that you could sum up the third metric in one word: soul. The heroine’s journey is the soul’s drive toward wholeness. Chances are you’ve had an entry point of your own. What was it? We traverse many paths in our climb, ‘we’ climb many mountains. Sooner or later we realise that the destinations on these paths, these peaks are unable to deliver the peace and happiness that we are looking for. This brings us to a different path with a much different vision and direction of travel ie the spiritual path. The point of entry is that realisation that ‘we’ were. not only racing in the wrong lane, we dont even need to race. The destination is a fallacious concept. The journey is in itself the aim or the destination. Your point about creativity is interesting. Creativity is perhaps an easy entry point as it is a state of closeness and resonance with the soul. That is why I have said in the past that ‘ Creativity is the modern religion’. A hero has to evolve to a higher level to reach the state you have decribed. Ego needs to be shed. Compassion needs to be imbibed. You have to melt your core to reach that stage of realisation. My first entry point happened when I learned that the guy I knew as my father wasn’t really my father at all. But I would likely never know who my biological father was. I was partially relieved because it meant that I didn’t possess a crazy man’s DNA. (As the least demented example of his behavior, he said the world would end in fiery cataclysm before I could reach my 25th birthday, and he made me constantly prepare for that day.) He only had custody rights every other weekend, but I was always consumed with fear and embarrassment. Still, when I learned the truth, I felt I’d lost my identity. And I felt I might never actually get back the soul he’d robbed from me. It took me a long time to realize he never had it, that I could still find it within and start my own journey. I am thankful for the experience. Because it taught me to recognize and let go of harmful outside influences and to seek the truth of who I am and how I fit in while staying empathetic to other people’s journeys. 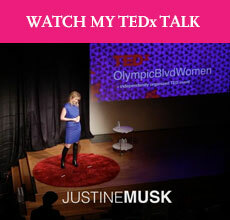 By the way, Justine, you rocked your TEDx talk. Your words and your powerful and generous vulnerability always resonate. Hell yeah. This post totally resonates with me. Most of my clients (and me) can pinpoint a moment, an event, a “sidduashun” that tipped us over the edge, yet at the same time, was the ‘breaking of the shell of our understanding’. Thanks. A beautifully written and touching post. Turning your wounds into wisdom is such a significant part of overcoming tragedy and adversity. Thank you for choosing the perfect words to share this meaningful message. @Minesh Khashu This blog was originally intended as a creativity blog — and if I had to characterize it I would still it call it that — but as I read and research the topic I realize that you can’t really separate creativity from identity and spirituality (which can be thought of as psychological growth). Which is one reason why I so often find myself writing or saying: We are what we make. This is also, I think, why the rat race is so destructive and soul-killing: because anything that is about competition is also about conformity — conforming to whatever criteria is being measured, to whatever pre-existing standards determine the ‘winner’. Creativity is the very opposite of that: a unique expression or manifestation of your inner life that exists in a category all its own. And yes, the journey makes you — which is why we shouldn’t just think in terms of what we want to accomplish, but who we want to be. @Suzi McAlpine Breaking the shell. What a great phrase. Yeah…it’s an initiation: a separation, a breaking of old boundaries and a shattering of your sense of ‘normal’, new growth, then integration and return with new insight, new powers. And it’s part of life, part of the human experience, to go through this over and over again. But in this age of shiny happy thinking, we’ve really lost sight of that. So we get the rug pulled out from under us and are made all the more miserable by it. I’m a writer and a storyteller, so I think that’s why it’s so easy for me to know that the meaning — like in any good story, which is practice and coaching for life — is in the struggle and how it changes you. We’re not wired for happiness — happiness is a byproduct of other things, like gratitude and purpose and connection — which is why chasing happiness can be, if anything, counterproductive. (Especially when we confuse it with materialism and hedonism, which is what a consumer culture inevitably does.) We’re *wired* for struggle, learning and growth. @Jennifer I agree! Neuroscience bears it out, too: when you start writing, for example, you immediately shift to a different part of your brain that allows you to detach, process and get perspective. (Or something like that). And as soon as you start thinking about how you can use this experience to help others, you’re no longer so trapped in your own head — you’re reaching out again. And reaching out is everything. Creativity, in the form of writing, helped me through a lot of difficult years. (This post mentions some of them- http://jakonrath.blogspot.com.au/2013/12/guest-post-by-avril-sabine.html) Resilience, and plain old stubbornness, certainly helped me keep moving forward when it would have been so much easier to give up. As usual, great post, Justine. I also like the talk about your entry point or drop point. Mine was when I was 34 and had to be hospitalized for about a month. My career and earnings came to a screeching halt and I had to redefine who I was over the next year as I healed. It shifted things a bit. It always amazes me that my life can ‘seem’ great but somehow I know I am in for an adventure..or a big reset. It’s not the same kind of pain or struggle I create for myself by taking on too much or doing something dumb – it’s something that I somehow know just has to happen before I can really understand or appreciate a lesson. This kind of pain has almost a different flavor. It’s so much deeper and more real but ultimately more glorious in it’s outcome. @Avril Sabine Poignant blog post; you’ve got the kind of grit that shines through everything else. Makes me think of Elaine Showalter’s history of women writers — A LITERATURE OF HER OWN — do you know it? (It looks like this big dry academic read, but I could not put it down.) What’s striking is the vast number of female writers — perhaps even most of them — who started out young, talented and ambitious but get sidetracked by children and the neverending demands of domestic life (or thwarted by husbands and fathers who usher them into much more traditional roles) so that their talent never comes to full fruition. That won’t be the case with you. Love your name, btw. @Rocco SAuvage You and Arianna would have a lot to chat about over coffee. :) If you wrote a memoir about those experiences and how they impacted your identity, I would buy it….One thing that strikes me is how the culture pays lip service to this idea that money isn’t everything, but doesn’t really seem to believe it, deep down, because running alongside seems to be this attitude that if you do have a lot of money you couldn’t possibly have any ‘real’ problems. Which is not to say that financial problems aren’t brutal and difficult and cause crippling anxiety — just that, some people might be surprised at all the problems that success doesn’t solve (and can even create or make worse). Which makes it so important for people like Arianna to say, Wait a freaking minute. There is something seriously wrong here….You need power to change the world. But you need love + joy to want to be *in* the world in the first place, and without health, as they say, you don’t have much. @JH I think I know the feeling. It’s not stagnation but incubation….something new is getting ready to be born. It’s like your soul knows what it is before you do, and won’t let you know until you’re ready. @Justine Musk I haven’t read a ‘A literature of her Own’. Luckily I never had the problem of a father wanting to steer me into a traditional job. My father wanted one of us, he didn’t mind which one, to be an electrician like him. He would get us to help him fix electrical things around the house like fans and video players. When I was a kid, I asked him if I could have lights in my dollhouse and he gave me all I needed to wire it up with 12 volt lights myself. I love my name too, which is a good thing since it’s my birth name.